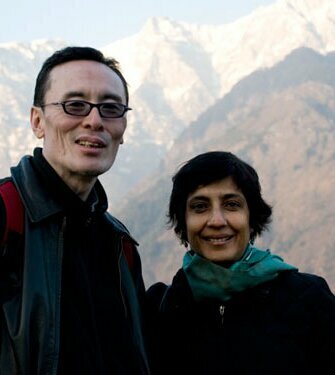 Ritu Sarin and Tenzing Sonam have been making films on Tibetan subjects for more than 20 years. Through their work they have attempted to document, question, and reflect on, the issues of exile, cultural identity and political aspiration that confront the Tibetan diaspora. At the same time, they have consciously made an effort to dispel some of the more romanticised and exoticised representations of Tibet and its culture that have found currency in the Western imagination, by taking a more intimate, sensitive and realistic perspective. Working through their film company, White Crane Films, they have produced and directed several documentaries, including: The Reincarnation of Khensur Rinpoche (1991); The Trials of Telo Rinpoche (1993); A Stranger in My Native Land (1997); and The Shadow Circus: The CIA in Tibet (1998). In 2005, they completed a dramatic feature film, Dreaming Lhasa, executive produced by Jeremy Thomas and Richard Gere. The Sun Behind the Clouds: Tibet’s Struggle for Freedom, is their most recent work.